One of the biggest problems with home PC-based flight simulators is replicating the real-world panel the pilot flies. Real-world airplane panels have a wide range of available equipment, and almost never match up with the simulator program’s configuration. A lot of training time goes to waste learning the panel that’s on the computer screen, or unlearning procedures that don’t match up with the real airplane’s equipment. Online retailer Pilot Mall has addressed that very problem with its Advanced Panel cockpit simulator program. Using Saitek’s ProFlite instruments (software driven replicas of mechanical round dials), the system is sold ‘a la carte’ so users can easily set up the configuration to match their needs. It’s also easy to change or upgrade the system to accommodate new equipment. The pop-out instrument cutouts are designed to make adding or removing components easy and neat. 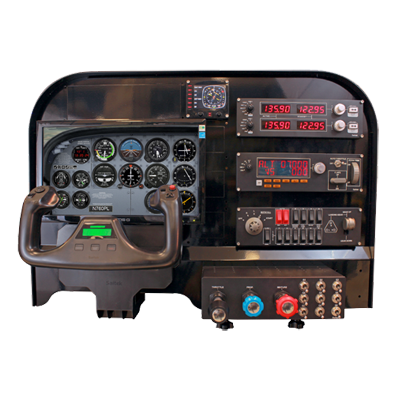 The Advanced Panel includes six-pack instruments (sorry, no glass panels yet); CDI displays; autopilot; annunciator panel; yoke; throttle/prop/mixture quadrant; and rudder pedals. Buyers can choose how much they want to add to their systems. The metal instrument panel sells for $395 — with a special $100 discount offered during the current Sun ‘n Fun show — and the recommended package, including 10 round instruments at $139 each, runs $2,504 with the discount. Check it out at www.pilotmall.com.